Digi International, a leading global provider of business and mission-critical machine-to-machine (M2M) and Internet of Things (IoT) connectivity products and services, has announced the availability of a Complete Platform for Rapid Development and Prototyping of Secure Connected Devices and Applications featuring the Smallest Wireless i.MX6UL System-on-Module Platform in the Market. 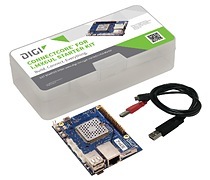 Digi International ConnectCore® for i.MX6UL Starter Kit. Build. Connect. Everything. MINNETONKA, Minn., Sept. 26, 2016 – Digi International®, (NASDAQ: DGII, www.digi.com), a leading global provider of machine-to-machine (M2M) and Internet of Things (IoT) connectivity products and services, today announced the immediate availability of the ConnectCore for i.MX6UL Starter Kit, a universal and powerful platform for rapid development of smart and secure connected devices. • A complete IoT design platform: The kit allows designers to address all development needs including a reference design for module integration, a prototyping platform for quickly creating proof-of-concepts, and a complete development environment to bring module-based designs to mass production. o A compact 87 x 63 mm form factor with mounting options, industrial operating temperature range, 256 MB of highly reliable NAND flash, and 256 MB DDR3 memory. o Choice of wired and wireless network connectivity through 10/100 Mbit Ethernet networking, pre-certified 802.11a/b/g/n/ac networking and Bluetooth 4.2 with Bluetooth low energy (LE) connectivity. o Grove connectors for rapid prototyping using a wide range of off-the-shelf Grove system sensors, breakout connector with access to all key module signals, USB host/device connectivity, SD card storage, and an on-board interference-hardened stamped metal antenna. • An intelligent and secure communication engine: Based on the new NXP i.MX 6UltraLite applications processor, the ConnectCore for i.MX6UL System-on-Module (SOM) is designed as an intelligent embedded platform featuring an extremely small footprint and low power consumption to build highly cost-effective and dependable connected devices without the traditional hardware or software design risk. The module offers a unique low-profile, patent-pending Digi SMTplus™ surface mount form factor slightly larger than a postage stamp that provides two cost-optimized integration options (fully featured LGA, and simplified castellated edge vias), and ultra-low power operation using seamlessly integrated Microcontroller Assist (MCA) capabilities. With Digi’s complete Linux Board Support Package (BSP), the Starter Kit delivers an integrated and tested Yocto Project Linux software platform with regular maintenance based on current, stable releases with full source code access. Additionally, the new Digi TrustFence™ Device Security Framework provides critical device security features out-of-the-box, such as secure connections, secure boot, encrypted file systems, access-controlled ports and seamless integration of a dedicated on-module Secure Element (SE). 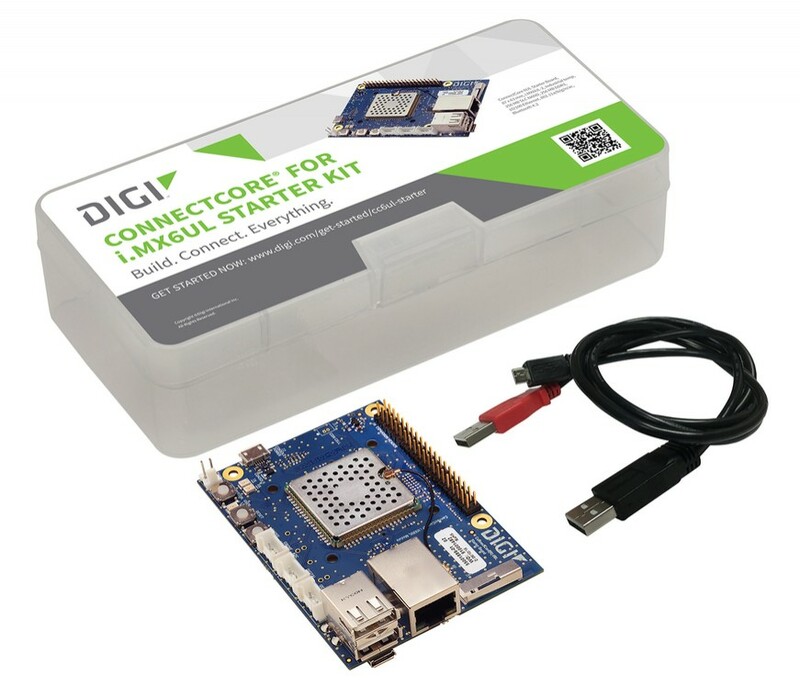 Digi ConnectCore 6UL development kits will be available in two versions: The ConnectCore 6UL Starter Kit* is now available at $124 and the ConnectCore 6UL Development Kit* will be available in Q4 of 2016 at $249. Kits will be available from authorized Digi distributors. To place an order or obtain more information about the ConnectCore 6UL, please visit www.digi.com/cc6ul or for a video overview visit www.digi.com/videos/cc6ul. *Starter and SBC boards are production-ready and will be made available for purchase separately. Both kits are also reference designs for the Digi SMTplus LGA and castellated edge vias module design integration, with complete design source file availability. Limited ConnectCore 6UL module sample availability in October of 2016, with initial volume production scheduled for Q1 2017 with volume pricing as low as $33.